I’ve started all of these books and the real problem is that they are all excellent. It’s so easy to choose one wonderful book from an otherwise mediocre selection. 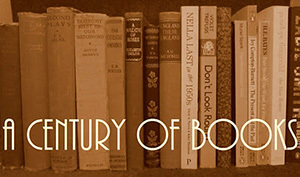 It’s much harder to prioritize one engaging, intelligent, entertaining book over its equal. And yet that is exactly what I need to do now or else I shall just be paralysed with indecision and the stack will keep growing and growing. But what to pick? I’m furthest into Miss Ranskill Comes Home by Barbara Euphan Todd and I know it would be the quickest to finish, but, with a whole rainy Sunday stretching before me, Sailing to Sarantium by the fabulous Guy Gavriel Kay beckons. The Last Chronicle of Barset by Anthony Trollope is also calling to me, reminding me that Trollope really is the perfect Sunday author, full of humour, warm domestic scenes, and some of my favourite characters. And then there are all the non-fiction choices: The Politics of Washing by Polly Coles, which would let me escape to Venice for the day; The Village Effect by Susan Pinker, which would probably remind me that I should be out socialising instead of reading the day away; and Women of the World by Helen McCarthy, which is inspiring me with tales of diplomatic life and politics (and reminding me of my youthful desire to become a diplomat). Difficult choices lie ahead but at least they’re pleasant ones. I’ll “never learn” either, Claire; my pile(s) continue to teeter. Good luck in weeding these good choices out. I’m knee deep in “The Bees” at the moment. Know I won’t finish it soon, so, also checked out the audio of it. Sigh. Not looked in for a while – how did that happen? I really don’t know, so am making up for my tardiness right now. Women of the World has been written – as I expect you know – by Elaine of Random Jottings of a Book & Opera Lover’s blog’s daughter, if that makes sense. 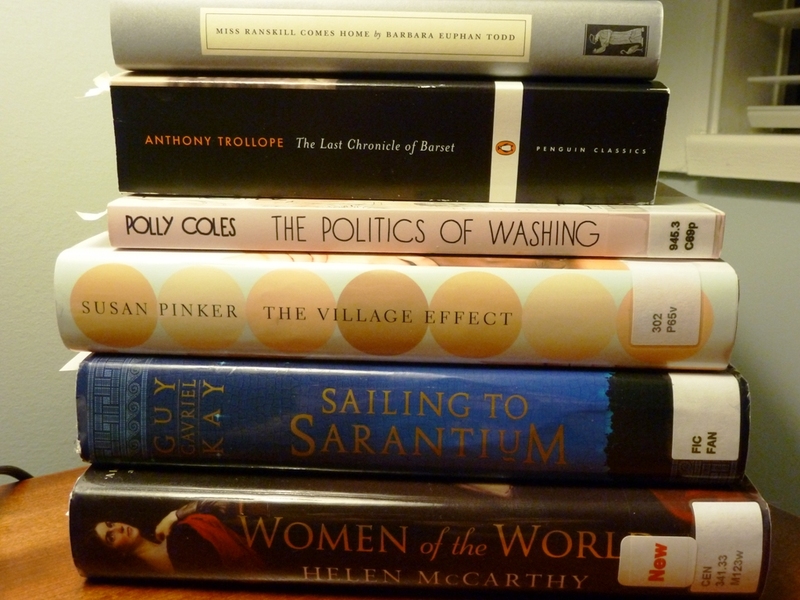 That is a fascinating pile, However, I find it impossible to multi-task between books. A pragmatic answer might be to read the library books first in order to return them on time, but I see that you have 4 of them! Oh, such a tough choice. I’d be interested to hear what you chose. My immediate vote was for Sarantium, and then I saw the Trollope. I am reading Thackeray right now – Pendennis – and he is making me want to read Trollope instead. I can’t believe you are reading all of those books at the same time. My brain struggles when I have to read two books at once. Ahahaha, I so respect people who can keep their books on a bedside table. Any bed I’ve ever had has quickly become a nest of blankets and books. I am going to have to do some minor excavations today to find my overdue library books inside my bed nest.